On Wednesday, 21 November, the 4 Heatons Traders association and the Heatons WI held their first ‘Kick the Plastic’ event at Heatons Sports Club. The aim of the evening was to provide and share information, as well as encourage discussion and ideas around the issue of plastic pollution. Professor Woodward’s presentation highlighted the sheer scale of plastic pollution in the river systems of Greater Manchester, including the rivers in and around the Heatons, all of which eventually ends up in the sea. While industrial waste is one source of this plastic pollution, the break-down of plastic rubbish – such as plastic bottles, bags etc – is another significant source. Furthermore, the issue of plastic consumption by humans was raised, as well as the fact that microplastics are continually being ‘recycled’ through our systems – not only by eating fish which consume microplastics in the rivers and seas, but also through crops which are fertilized with treated human sewage that contains microplastics. Following this presentation, Amanda Fourie, COO of the 4 Heatons Traders Association, introduced the Plastic Free Community initiative run by Surfers Against Sewage. Begun as a way to tackle plastic pollution around the UK coastline, the initiative was extended to include non-coastal communities and provide support for their efforts. The Heatons has been registered with the Plastic Free Community scheme and we aim to work towards official plastic-free status, joining a network of over 400 communities across the country. Sue also discussed ideas on how to reduce or reuse single-use plastics in the home. The Heatons WI had made a foot-stool using plastic bottles as the base and Sue also explained how to make plastic-free food wraps using a piece of cotton material and grated beeswax. Jodi Flannery, a Heatons-based Eco-Consultant, informed the group of the work she has been doing with the 4 Heatons Traders Association to encourage local businesses to replace single-use plastics with sustainable alternatives. 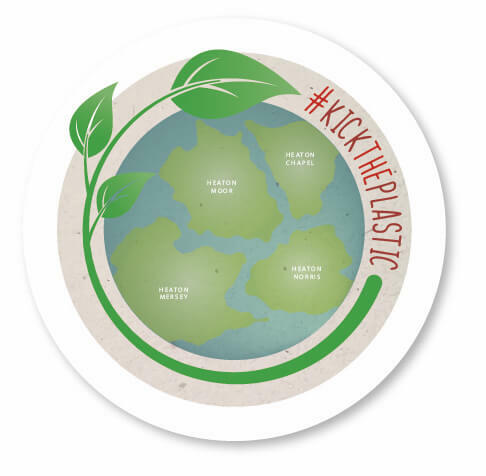 The ‘Kick the Plastic’ initiative has received great support, with many Heatons businesses pledging to no longer use plastics. Jodi also discussed some of the ways to reduce the use of plastics in the home and explained the creation of ‘eco-bricks’. Following the talks, a general discussion was encouraged and those in attendance were asked to note down any ideas on how we can further tackle the issue of plastic pollution. Sustainable Living in the Heatons, the Heatons WI, and the 4 Heatons Traders Association, each had tables displaying information and some of the ways they are helping to reduce plastic use. The evening concluded with a brief mention of TerraCycle stations by Sue, which we are hoping to locate in a suitable place within the Heatons, and which would act as a collection point for those plastics that cannot be recycled through local authority collections – biscuit wrappers, coffee pods etc. The Heatons WI and the 4 Heatons traders Association aim to continue their collaboration in tackling plastics with the aim of hosting a similar annual/bi-annual organised discussion as a way to keep the Heatons Community informed and continue to share knowledge and ideas.